JustaBXgirl has been an artist since she was born. She loves to create. In fact, she will tell you one of her career goals in life is to be an artist. 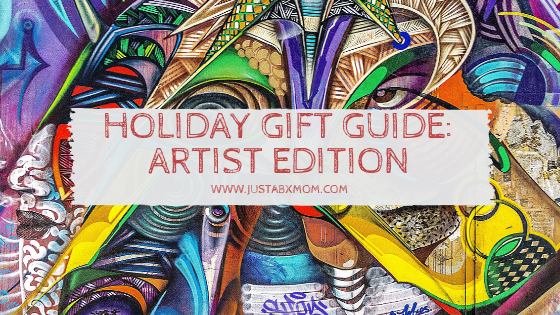 Surprisingly, I have never done an artist gift guide before but the cards aligned this year and I was able to pull one together! Learn to Draw Star Wars: Volume 2 – Do you have a Star Wars lover on your shopping list? Just when you thought they had all things Star Wars I’m betting they don’t have this or Volume 1. This is great for beginner artists as it includes step by step instructions, tracing paper and practice pages. When finished with this volume your artist will be drawing Rey, BB-8, Kylo Ren, and more in no time. Check out Volume 1 to learn how to draw Luke Skywalker, R2-D2, C-3PO, Han Solo, Chewbacca, Princess Leia, Darth Vader, a Stormtrooper, and Yoda. Learn to Draw Disney Princesses – You already know we are here for all things Disney Princess! Getting to learn how to draw them opens all types of possibilities. This book breaks the characters down into shapes for step one and adds on a bit more with each step. It also includes fun facts about the princesses as well as art instructions from Disney Animators. Folk Art Fusion – This book is a work of art. I shared it with the staff at JustaBXgirl’s school while they were studying Frida Kahlo and they fell in love. When you first look at the images you feel as if there is no way you can recreate them but through the instructions, they become simple enough that even a non-artist like me has a chance to create something beautiful. Frida is only one of the recognizable works you will recognize in this book. The Little Book of Sketching – This is a fun book that helps bring your doodles into drawings. This is a good reminder that art doesn’t have to be grand. It can be found in simple things and simple moments. There are also prompts that help artists move their drawings forward. Pocket Art – Figure Drawing – This is the perfect gift for the serious artist. It is a good guide to working on figures. It’s also a great size which makes it easy for the artist to take it places and use it on the go. This is not necessarily for the beginner artist but can be used by a beginner to be inspired. Paint-Sation – I know I said I wouldn’t include things in the gift guides that I’ve talked about before but we love Paint-Sation and since most of the things in this guide aren’t for littles I thought I would add this here. This is art littles and parents can love. No more worrying about the paint spilling or getting knocked over. And they have so many colors even though the sets come with primary colors.